I can’t join an unorganised party like APC – Bode George – Royal Times of Nigeria. 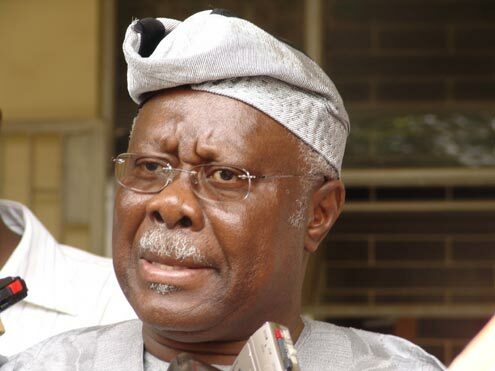 Former Deputy National Chairman of the Peoples Democratic Party (PDP), Bode George has denied reports that he is planning to join the All Progressives Congress (APC). In an interview with Vanguard, George denied claims by the Lagos APC Chairman that he is planning to join the ruling party. He said: “I was told, I did not read the story and I felt that was the greatest joke of the year. He (Ajomale) is older than me, I will respect his age but it is a wishful thinking, I can never abandon a party well organised, a party well entrenched, a party that is the most nationalistic in its colours, its composition, regulations, and membership and go to a party that is a congregation of strange bedfellows. They are yet to get their acts together. “I am well trained, I have been to strategic schools and I know what is good for this country. I won’t waste my time; maybe he woke up from the wrong side of his bed and was day dreaming. If he is looking for the big fish, he should go and look among themselves, not me and not even anything that I stand for,”.